Part two of my “brief” tour of CSE’s facilities, past and present. CBNRC’s (CSE’s) second headquarters was in a former convent that had been used as a military hospital during the Second World War. After the war the building was no longer needed as a hospital, and in October 1948 the Grey Nuns rented it to the NRC, which was looking for a new home for CBNRC. In August 1949 the Department of Public Works let a contract to renovate the building to serve as the home of both the CBNRC and the NRC’s Division of Radio and Electrical Engineering (REED). At the time, REED had about 250 employees and CBNRC was growing towards its approved establishment of 227. The two organizations were thus expected to have a total of about 475 employees, which is about the number of people a building of that size would have been expected to accommodate at that time. Among other modifications made to the building in preparation for CBNRC's arrival was the installation of an incinerator for the destruction of classified waste, eliminating the need to truck waste to the NRC’s Montreal Road site for secure destruction. CBNRC’s Comcentre was moved to the new site, now called the Rideau Annex, in December 1949. 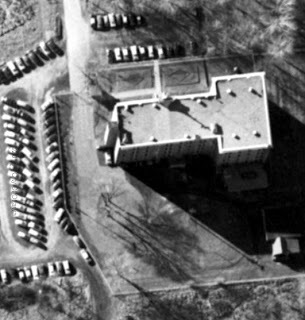 The rest of CBNRC moved to the site in January 1950. It is not clear whether REED ever took up residence in the building. If it did, however, it was quickly pushed out. By 1950 the Cold War was rapidly heating up. The Soviets had tested their first atomic weapon, based on a stolen U.S. design, in August 1949, and in June 1950 the communist regime of North Korea invaded South Korea, starting the Korean War. The post-war demobilization of Canada's armed forces was rapidly reversed and military spending skyrocketed. Intelligence-gathering was also stepped up dramatically. In November 1950, CBNRC’s establishment was increased to 393. Four months later, in March 1951, it was increased to 449, twice the size it was when CBNRC moved into the Rideau Annex and enough to require the entire building. At the time CBNRC moved to the site, the Rideau Annex was surrounded mainly by farmland. 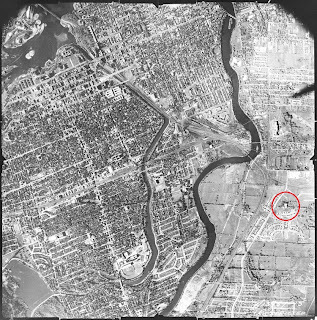 Located east of the Rideau River near Hurdman Bridge on Alta Vista Drive (which was then Churchill Drive in Gloucester), it was nicknamed “the Farm” by those in the know. Kristmanson also reported an interesting bit of detail about operations within the building: "The Branch's administrative sections occupied the Nunnery's lower levels, preparing briefs to be transported twice daily by armed courier across the bridge and downtown to the Privy Council Office in the East Block of the Parliament." The building was vacated by CBNRC in 1961 and demolished sometime during the 1960s, so it is not possible to visit the building today. 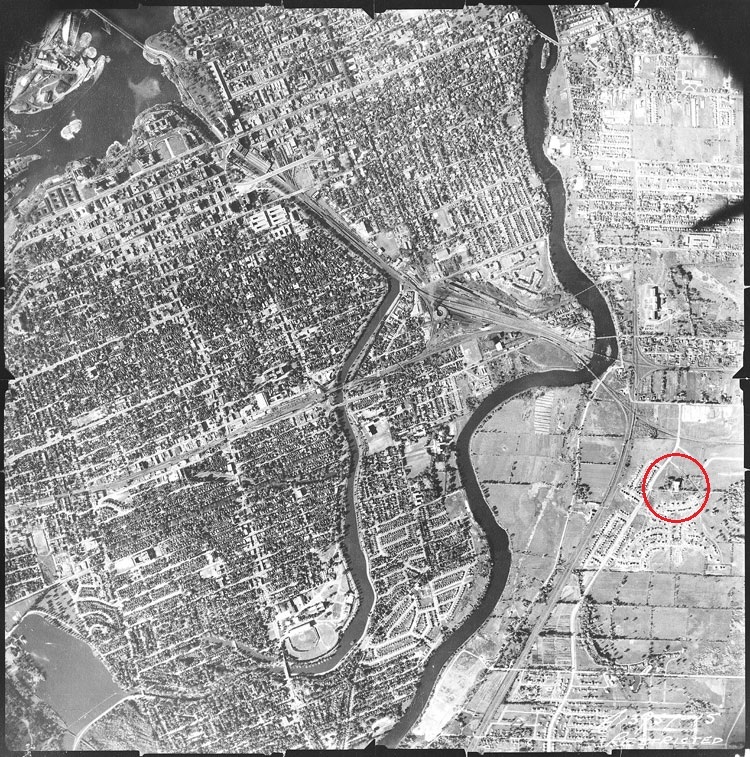 However, this 1953 air photo shows the location of the Rideau Annex (circled in red). The spot is now occupied by the Alta Vista Towers apartment buildings. This website confirms that the Alta Vista Towers were built on the site of the former Grey Nuns convent. Here is the spot today. CBNRC’s years in the Rideau Annex were a time of rapid growth and transition for the agency. 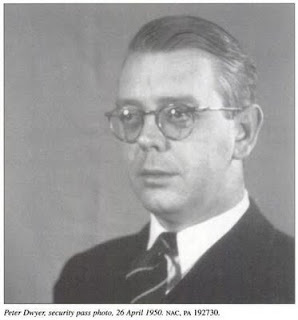 CBNRC Director Ed Drake was a Canadian, but much of the upper echelon of the organization had been and was still being recruited from Britain at that time, and by early 1950 resentment began to boil over within CBNRC over the lack of opportunities for Canadian staff. As the History of CBNRC tells it, "The word went round among the CB staff that NRC had come to mean ‘No Room for Canadians’" (Chapter 27, pp. 28-29). The appointment of former MI6 officer Peter Dwyer as Head of Reporting, replacing Steve Diditch, the Canadian who had been serving as acting head, was one of the catalysts of the controversy. Dwyer moved to the Privy Council Office two years later, and eventually became Director of the Canada Council. Diditch was formally confirmed as Head of Reporting in 1953. Recruits from Britain continued to play leading roles in the agency for several decades to come—Kevin O’Neill, recruited from Bletchley Park in 1946, served as Drake’s second-in-command from the departure of GCHQ official Geoffrey Evans in 1949 until Drake’s death in 1971; he then served as Director CBNRC (and first Chief of CSE) until his retirement in 1980. 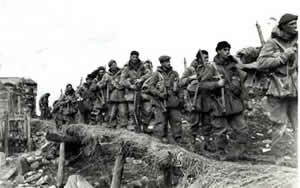 By the mid- to late 1950s, however, the dominance of British recruiting was over and the controversy had died down. The Rideau Annex was an improvement over the facilities CBNRC had occupied in the La Salle Academy. But it was far from ideal by today’s standards, with no air conditioning, primitive electrical infrastructure, and only one cantankerous freight elevator. Other aspects of security, beyond the lack of window screens, were also rudimentary by today’s standards. More importantly, the building lacked any kind of modern emission security features to prevent eavesdropping on inadvertent emissions from its cryptographic and other electronic equipment. The Western intelligence community had become acutely aware during the 1950s of how top-secret information could leak through cables, power lines, and even through the air, and it was busy both exploiting and attempting to defend itself against the phenomenon. The History of CBNRC records that “GCHQ showed great concern” about some redacted element of the Rideau Annex’s security (Chapter 26, p. 21). Almost certainly, its concern related to emission security. Size also eventually became a problem. By 1956-57, CBNRC had grown to close to 470 staff, roughly the same as the combined CB and REED establishments (about 475) at the time the Rideau Annex was first occupied, suggesting that the building was probably close to full. And it was still growing. By the end of 1958, CBNRC's staff target had risen to 600 employees, a total that could not all be accommodated at the Rideau Annex. To ease the crowding, T&D Section, later known as T Group, was moved to temporary accommodations in NRC’s M36 building at its Montreal Road campus. The move took place in November 1956, just as the brand new building was opening. The building is currently the home of NRC’s “Design and Fabrication Services”, and it is possible that it housed the same kind of activities when it opened. T&D Section’s work, which involved the production and distribution of COMSEC materiel, may have been considered in need of less rigorous secrecy than SIGINT work and certainly would have been more easily separated from the work at the main building than any section of the SIGINT program. By the late 1950s, it had become clear that the Rideau Annex was no longer a suitable location for CBNRC. Its age, its lack of emission security features, and, ultimately, its size led eventually to a decision to build a new headquarters specifically for CBNRC. The contract for construction of the Sir Leonard Tilley building was let in February 1959, and in June 1961, fifty years ago this month, CBNRC moved out of the Rideau Annex and into its new home. Interesting, I found some black and white images of this buildings in boxes at the City of Ottawa Archives today. I was trying to find a history of the building and found your site. Good work. Hi, Marc. Thanks for the note! If you get a chance to make copies of the Rideau Annex photos, I'd love to see them. 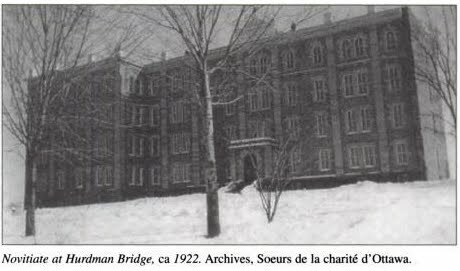 Hi, I am doing a small article about the Grey Nuns building on what became Alta Vista Drive, I would love to see any pictures that anyone has to help illustrate my article.